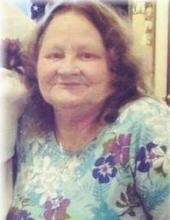 Millie Ellen Shelton of Dalton, Georgia and formerly of Williamsburg, Kentucky departed this life on Saturday, March 23, 2019 at the Hamilton Medical Center in Dalton, Georgia. She was born on March 18, 1950 in Jellico, Tennessee to the late Johnny and Mary (Preston) Cox. She was also preceded in death by her husband, Rev. Jerry Shelton. She is survived by three sons, Rev. Leo Shelton (Mary) of Williamsburg, Kentucky and Rev. Timothy Shelton (Sheila) and Rev. Jason Shelton (Sherry) of Dalton, Georgia; six grandchildren, Leo Allen Shelton (Scarlett), Jeremiah Shelton (Jennifer Donis), Joshua Shelton (Kristin), Shana Shelton-Akins (Brady), Kayla Shelton and Shannon Shelton; three great grandchildren, Brooklyn Shelton, Makensey Shelton and Evelynn Shelton; two brothers, Barry Cox of Dalton, Georgia and Willard Cox of Calhoun, Georgia; five sisters, Geraldine Collins (Butch) of Williamsburg, Kentucky, Lola Cox of Lafayette, Tennessee, June Mickle of Minnesota, Sue Beach of Williamsburg, Kentucky and Retha Randolph (Earl) of Williamsburg, Kentucky; several nieces and nephews; and a host of other family and friends to mourn her passing. Visitation will be after 5:00 P.M. Tuesday, March 26, 2019 at Croley Funeral Home. The Funeral Service will be at 1:00 P.M. Wednesday, March 27, 2019 at the Croley Funeral Home Chapel with Rev. Jason Shelton and Jeremiah Shelton officiating. Following the Service she will be laid to rest in the Wolf Creek Cemetery. To send flowers or a remembrance gift to the family of Millie Ellen Shelton, please visit our Tribute Store. "Email Address" would like to share the life celebration of Millie Ellen Shelton. Click on the "link" to go to share a favorite memory or leave a condolence message for the family.